I was asked to try resurect a some loudspeakers. Made in West Germany dates them pretty well. The familiar foam rot had set in but the midrange and tweeter appeard to be in good condition. The woofers were open circuit and a dissection suggested that the voice coil had been wobbling around (scrape marks on the bobbin) and causing a break in the coil. The boxes are well made sturdy and filled with some fiber glass at the back and top. With a high Q driver some improvement can be had by adding more fiber glass or other damping material. The crossover seems to be quite resonable, probably a mix of 6 and 12 dB filters. The impedance curve is taxing. Here I had a Seas 8 Ohm woofer replacing the orignal woofer. The impedance is below 3 Ohm from 150 to 400 Hz the range where music has it's highest power demands. At 6 kHz the impedance dips to 1 Ohm! That is really low but the energy content in music is much lower there so the demands should not be that bad. 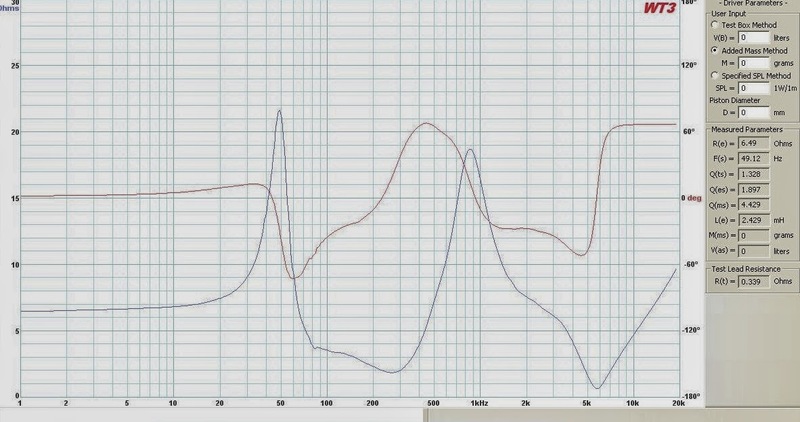 With some more damping material added I hope to lower the Qt below 1.0 and the Fr down in the 45 Hz range. The integration between the woofer and midrange might be tricky but I will try to keep the original crossover and use just a Zobel filter and phase switches to get the work done.